This year I feel like Easter kind of snuck up on me. It’s 2 days before the big day and miraculously I have yet to consume 1 Cadbury Egg. I usually have my hidden stash of Peeps opened in the back of the cabinet by now (because OBVIOUSLY the only way to truly enjoy a Peep is to eat it stale), but they haven’t even been purchased yet! And I always have my son’s Easter basket shopped for, decoratively assembled and wrapped in cellophane weeks in advance. But, not this year! I have 2 days left to make up for lost time and get my family ready for this happy holiday. If you’re in a similar situation, here are 3 of my favorite last minute crafts to get you and your family in the Easter spirit! 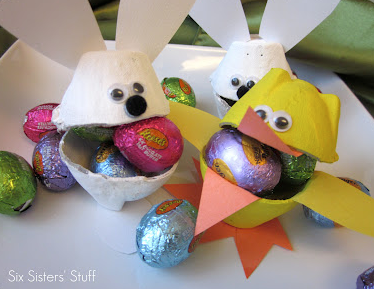 How cute are these egg carton candy cups from Six Sister’s Stuff? Do you have an empty milk carton, cardboard, pink and white construction paper, scissors and a marker? 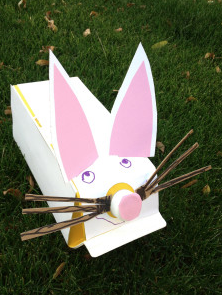 If so, you are good to go to make this festive milk carton bunny from Box Play for Kids. I can’t over these egg people! 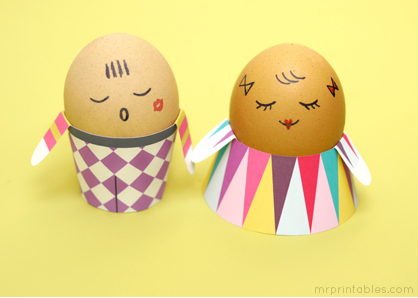 Simply download the free templates from Mr. Printables and draw funny faces on the eggs. So easy and so charming!